Ebony is a Nutritionist, Dietitian, Chef, who recently moved to the Peninsula. 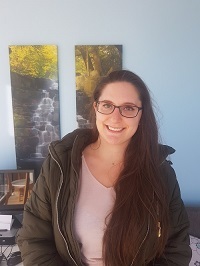 She comes with a wealth of knowledge regarding food preparation and nutrition which she integrates into her practice, providing clients with the skills necessary to maximise their health potential. Since graduating, she has worked in various locations across Melbourne assisting clients to control their chronic health conditions, such as diabetes, high cholesterol, kidney disease, irritable bowel syndrome, and complex mental health disorders. She has also assisted clients in pursuit of specific fitness goals, like completing the Kokoda trail, and to generally improve their health. Ebony has worked extensively with Veterans and is very keen to continue servicing this honourable population. In addition to the aforementioned common chronic diseases, she also has extensive knowledge on Vegan and Vegetarian diets, and dietary management of chronic pain, including fibromyalgia. Ebony will commence with our Practice on Thursday September 13.